Many businesses today need to leverage the Internet to boost sales, and an on-line store is a good place to start. rave7™ makes it easy to build a professional looking store with all the bells and whistles without coding. rave7™ LCM eCommerce - More Than Just An Online Store! • Restricted access catalogs are controlled through user name / passwords from the CRM database. Products can be managed on an individual basis or by multiple levels of categories and sub-categories. The CMS engine allows simultaneous updating of whole product groups with similar graphical or content block components ("digital assets") just by updating the asset once in the digital asset manager. All products with that asset component will automatically be updated. rave7™ Digital Storefront makes it easy to manage shopper accounts and order history. All orders placed through the shopping cart are immediately uploaded into the customer's profile in the CRM database; customers and Administrators can then access their accounts online to view order histories, download copies of invoices etc. Repeat orders can also be created directly from within customers' accounts, avoiding the shopping cart process, and email purchase confirmations can be automatically generated for shoppers' convenience. rave7™ Digital Storefront automatically tracks dropped or abandoned shopping carts and reports on them through the Admin Dashboard. Using the integrated rave7™ Multi-Channel Communications engine, the system can easily be configured by the Administrator to automatically issue immediate or timed communications to shoppers who abandon their carts as long as the contact coordinates are available; this is one example of the advantages of a fully integrated Life Cycle Management Suite like rave7™. rave7™'s LCM integration the Digital Storefront with the CMS (content management) engine also enables the addition of a shopping cart to any page of a rave7™-built and hosted web site by simply inserting a standard functional plugin on the page from the rave7™ plugin library. 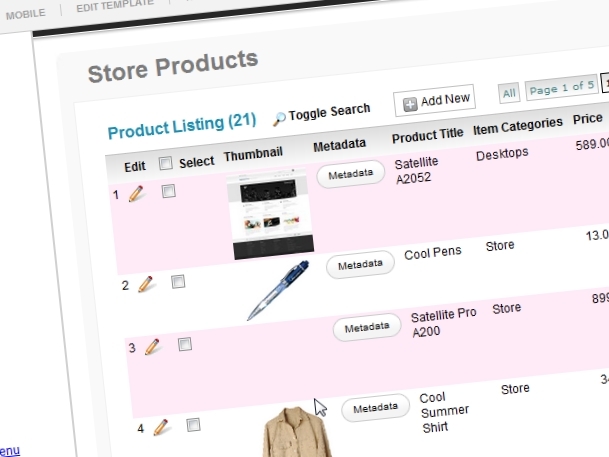 rave7™ Digital Storefronts also include standard product and meta-data search options that simplfy the shopping experience for shoppers by enabling searches using drop down menus and any number of user-defined search criteria. All products in a rave7™ Digital Storefront catalog are maintained through the internal product database (digital asset manager) that can be managed by anyone with Admin access authority. All rave7™ Digital Storefront catalog items can be maintained (add, edit, delete) by anyone with appropriate Admin-level authorization through the integrated CMS and digital asset manager. The rave7™ Digital Storefront shopping cart is integrated with several payment processors to simply the payment process for shoppers; they can choose to pay either through their PayPal account or using a major credit card, and upon checkout cart details are submitted to the selected payment processor. If the Storefront has been linked to the CRM database, shoppers can have access to their complete order history. To ensure security, card numbers are not stored in rave7™; they are maintained with the payment processor. However a part of the number or some other identifying data can be maintained in the CRM database for subscription / member shoppers to validate their identity. At checkout, shoppers have the opportunity to specify bill-to and ship-to information.